File photo of V Rohith, who was found hanging in a hostel room in the University of Hyderabad. 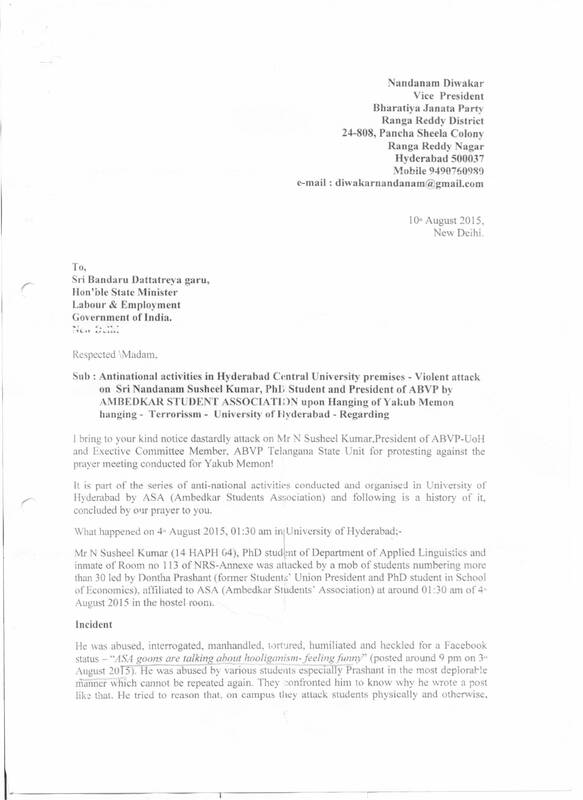 A fresh letter every two weeks and involvement of senior officials from an Under Secretary to the Joint Secretary of the Ministry of Human Resource Development have thrown the spotlight on why the Centre was so interested in pursuing a specific case of an alleged attack on a student in the University of Hyderabad. The trail of letters, demanding updates on action taken by the University against the alleged attackers, has now come to light following the suicide of Dalit research scholar Rohith Vemula. It is clear that the Ministry was actively pursuing this case and asking why the University had not sent its comments. Dalit activists claim that it was due to this pressure from the Ministry that five Dalit students were suspended and ostracised by the University, leading ultimately to the youngster taking his life. The Wire accessed the chain of missives from the MHRD to the University on what the HRD Minister now claims to be an “alleged clash”. The series of letters was kicked off by the Vice President of the Bharatiya Janata Party in Hyderabad, Nandanam Diwakar. Diwakar wrote on August 10, 2015, to Bandaru Dattatreya, BJP MP and Minister of State for Labour, six days after an alleged attack by Rohith Vemula and his friends, all part of the Ambedkar Student’s Union (ASA) on N Susheel Kumar, President of the BJP-aligned Akhil Bharatiya Vidyarthi Parishad, within the University. Diwakar exhorted Dattatreya to take up the issue with various ministers, lamenting about the “omissions and inactions of the university” which had encouraged “anti-national activities” in the University. Diwakar could not be reached by The Wire for comment. The MHRD took this up seriously and a series of letters from the ministry followed, each from an official more senior than the previous writer. On September 3, Under Secretary Ramji Pandey wrote the first missive to the Vice Chancellor of the University. It was a polite request from the MHRD to examine the issues mentioned by MoS Dattatreya and pass along the facts to the Ministry so that they could submit a response to the MoS. 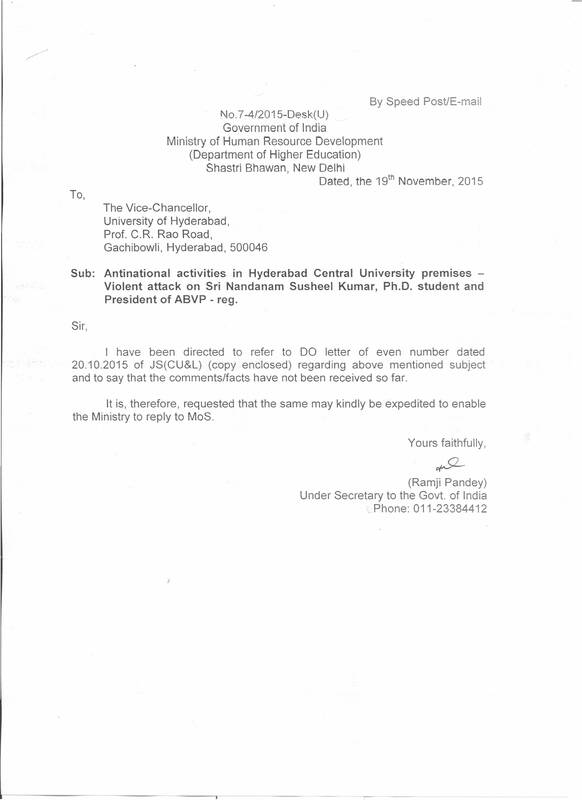 With no response forthcoming from the University, a second reminder was sent out from the MHRD about two weeks later. 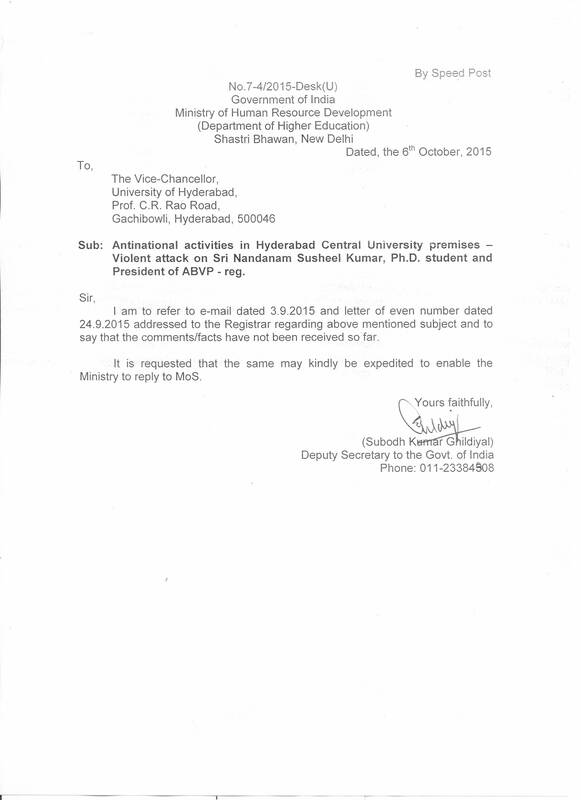 This time, Deputy Secretary Subodh Kumar Ghildiyal sent a letter by Speed Post to the Vice Chancellor. Another fortnight later, Joint Secretary with the MHRD, Sukhbir Singh Sandhu, jumps into the fray, requesting the Vice Chancellor Appa Rao Podile to personally look into the issue and respond. No reply came from the University. A month later, on November 19, it was Under Secretary Ramji Pandey’s turn once again to write a reminder to the Vice Chancellor. Union HRD Minister Smriti Irani addressed the media on Wednesday afternoon, seeking to clarify issues surrounding Rohith Vemula’s suicide and the subsequent uproar from the student community across the country. Stating that there were six communications from the MHRD to the University, Irani dismissed them as being purely “procedural” in nature, since the sender of the letter, Dattatreya was a VIP. She did not, however, elaborate on what response Dattatreya’s letter necessitated, since he had not requested any action to be taken by the Ministry itself. Also missing was any explanation as to how an alleged attack could possibly result in appendicitis – the ABVP President Susheel Kumar who alleged the attack by the ASA and was hospitalized in August 2015 is reported to have undergone a surgery for appendicitis as per the records of Archana Hospital in Hyderabad. Irani also urged the media to stop portraying the suicide as a Dalit versus non-Dalit issue. “A group of students allegedly attacked another student,” she said. “We have ascertained that this is not a Dalit versus non-Dalit confrontation. We are seated before you with facts and not conjecture, I again say it is not a Dalit versus non-Dalit issue,” she said. The minister’s comments have invited a strong reaction from Dalit groups and protesters. “She is trying to wash her hands of the issue and trying to divert the issue,” said R Ravikumar, Secretary of the National Dalit Forum. “There was no scuffle, no fight and no attack on anyone. The first report of the Proctorial Board clearly states that there was no attack. The students at the University called us Dalits PIGS in 1990 – Permanent Illegal Guests. They put up posters all over the campus. This is not a one-off event. This University has a history of caste-based discrimination,” he said. Caste continues to be at the heart of the issue, with conflicting reports arising from Gurajala village in Guntur district, where the Vemula family hails from. Speaking to The Wire, Badidela Srinivasa Rao, an advocate and next door neighbour of 45 years to the Vemulas, claimed that the family belonged to the Vaddera caste, an Other Backward Caste (OBC) and not to a Scheduled Caste. 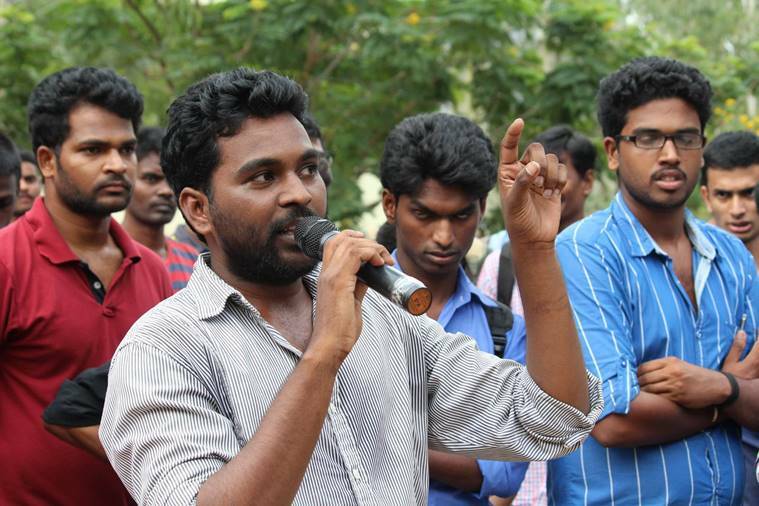 “I have known Rohith’s parents since we were young,” said Rao. “Both his parents belong to the Vaddera caste. I have in fact signed as the witness for an affidavit for Rohith’s younger brother’s birth certificate,” he added. 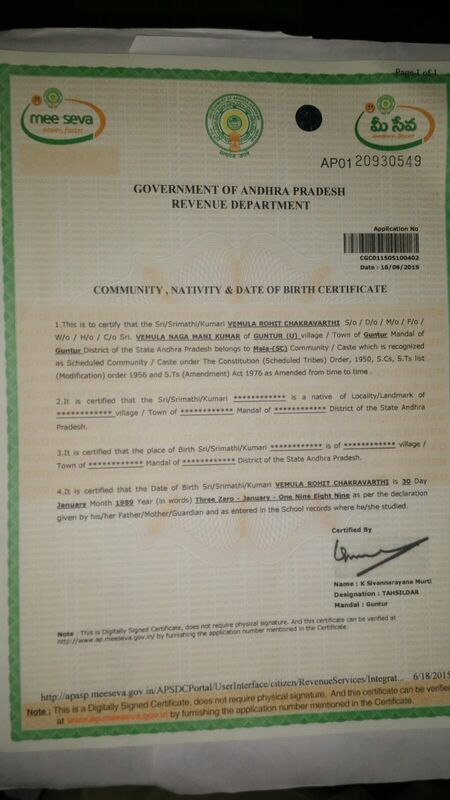 Rao shared a copy of what he claimed was the Telugu affidavit with The Wire – it is a letter of request to the Revenue Inspector from Rohith’s mother Radhika to register the date of birth of Raja Chaitanya Kumar (Rohith’s younger brother) since it was not registered at the time of his birth. 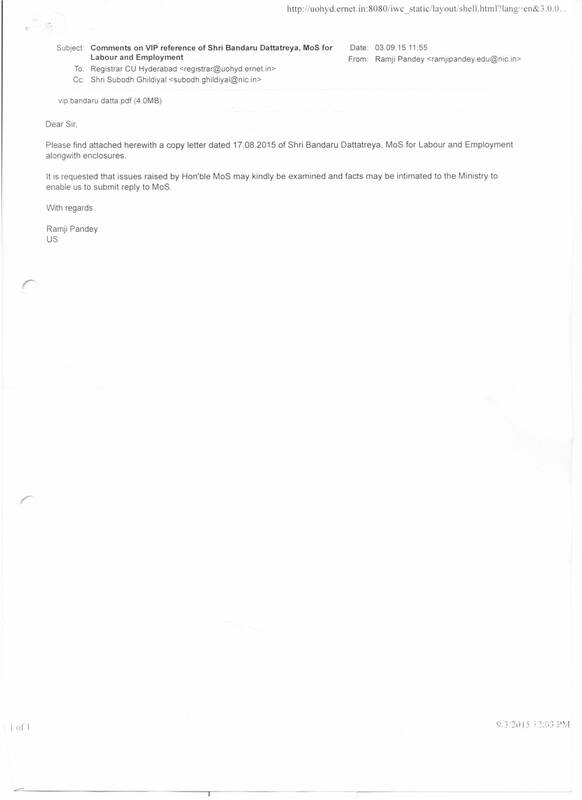 The document, whose authenticity The Wire is not in a position to confirm, states that the family belongs to the Vaddera caste. Vaddera is a caste originally comprising stone cutters and quarry workers and is one of the most economically weak groups in Andhra Pradesh, although not technically a Scheduled Caste. Rohith’s brother Raja Chaitanya Kumar, however, refuted this. Speaking to The Wire, he said that their family had certificates showing that they belonged to the Scheduled Mala Caste. “We have every proof of our caste,” said Raja. “The issue is being diverted. We want the truth about my brother’s suicide to come out. We don’t know why he committed suicide. We want the suspension of the remaining four students to be revoked immediately. Anything that the government can do for my family will be greatly appreciated,” he added. Rohith Vemula, a research scholar at the University of Hyderabad, committed suicide by hanging on January 17. He and four other Dalit students belonging to the Ambedkar Student’s Union were suspended, following allegations of an attack on the leader of the ABVP. A Proctorial Board enquiry cleared them initially but later reports placed the blame of the five youth and recommended suspension. In November 2015, their suspension was revoked partially and they were allowed to attend classes although hostels and administrative buildings and libraries were off limits to them. All five students had been staging protests outside the campus since December 2015, living in makeshift tents as their hostel rooms were locked by the University. Rohith Vemula left behind a poignant suicide note speaking of discrimination, accident of birth and broken dreams. As student protests intensify across the country, with demands for justice for Rohith Vemula, the University management has appealed for calm and requested students to return to classes.